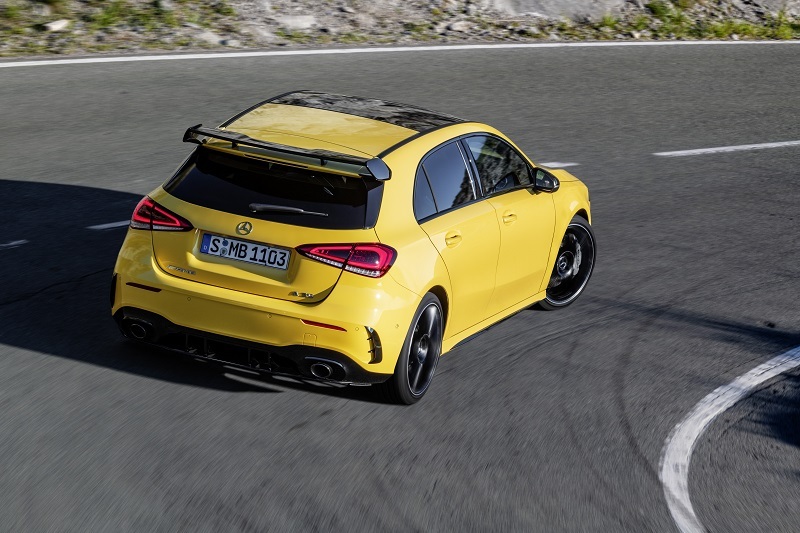 Since the new Mercedes A Class was revealed, hot hatch fans like myself have been eagerly waiting for the A45 variant, the hyper hatch that rivals the thunderous Audi RS3. That model is yet to surface, but in the meantime, Affalterbach’s finest has lifted the covers of the model that will sit below it – the A35. 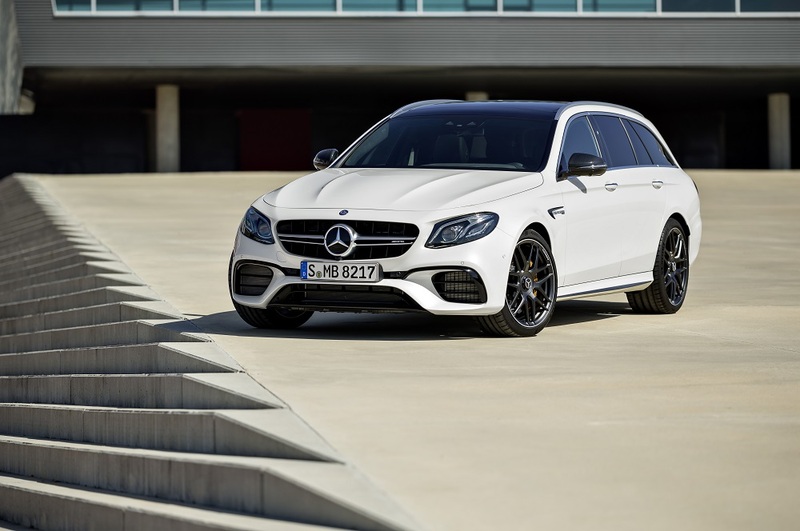 This serves as the entry level performance car for Mercedes-AMG, but that’s not to say it’s underpowered. 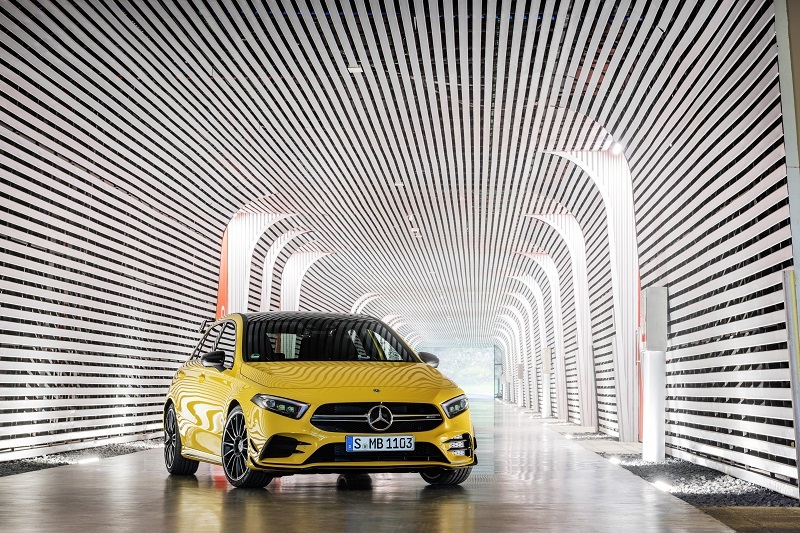 Providing power to the new A35 is a newly developed twin-turbo 2.0 litre four cylinder engine that is based on the M 260 four-cylinder engine. 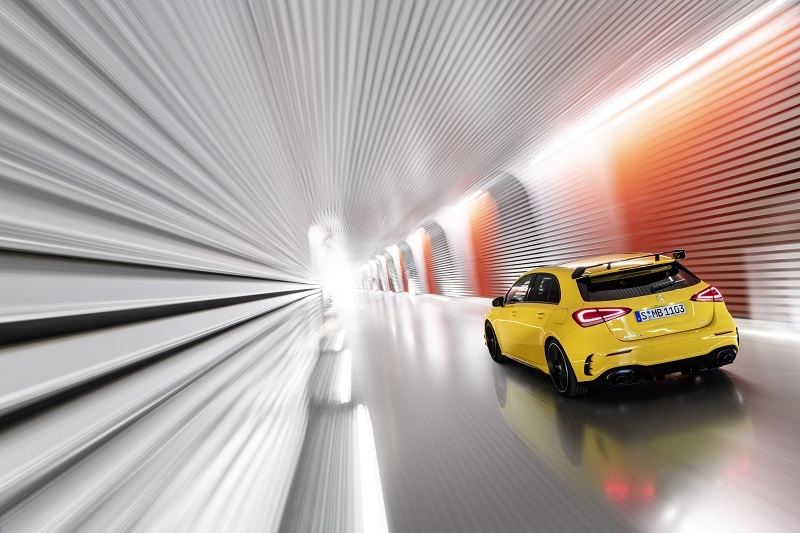 It offers a power output of 302bhp with 400Nm of torque. 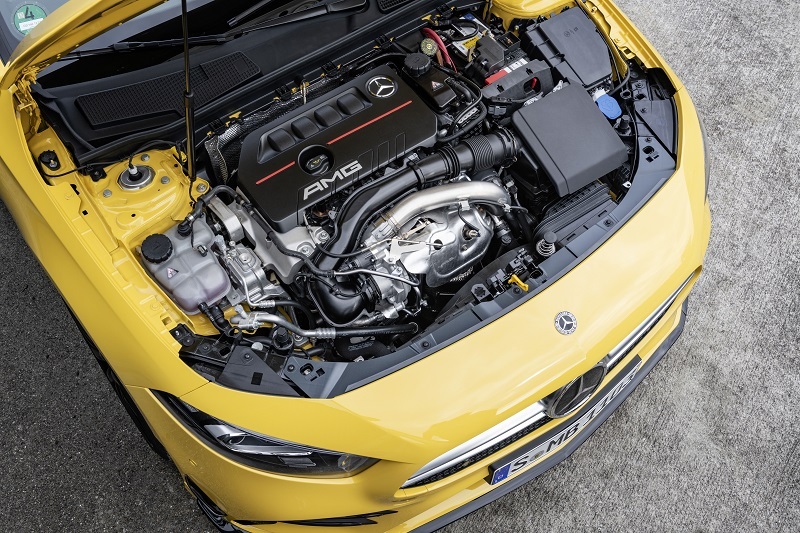 This power is fed to all four wheels thanks to Merc’s 4MATIC system via a 7-speed AMG SPEEDSHIFT automatic gearbox. All of this combined means that the A35 can crack 62mph in just 4.7 seconds, and it will top out at an electronically limited 155mph. It’s safe to say, its not what you’d exactly call ‘entry-level’ when it comes to power. As well as offering a healthy amount of power – especially for an ‘entry’ model – the A35 is armed to the teeth with clever tech to ensure that it drives as good as it looks. 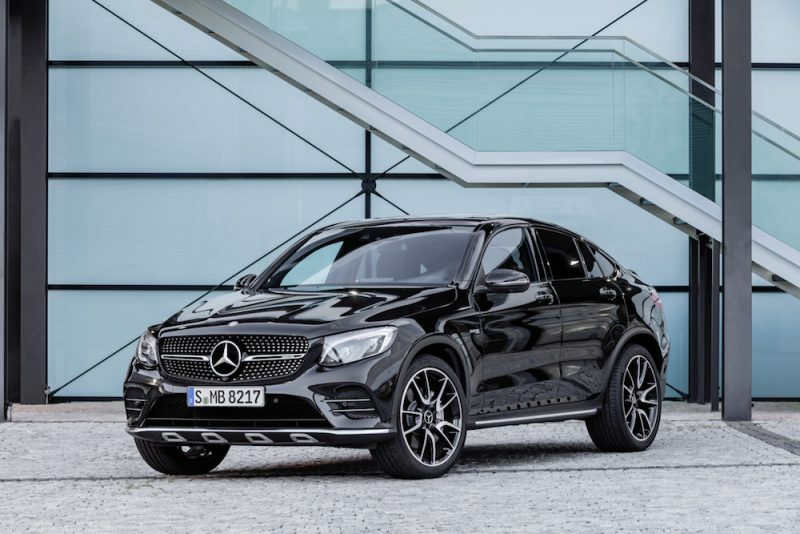 There are no less than five driving modes; slippery, comfort, sport, sport+ and individual. The first of that bunch, slippery, is a new driving mode and is used for when the roads are, well, slippery. This mode gives the car a flatter torque curve, along with reduced power (booooo) and smoother gearchanges. Then you have Comfort, Sport, Sport+ and Individual, which are pretty self-explanatory. 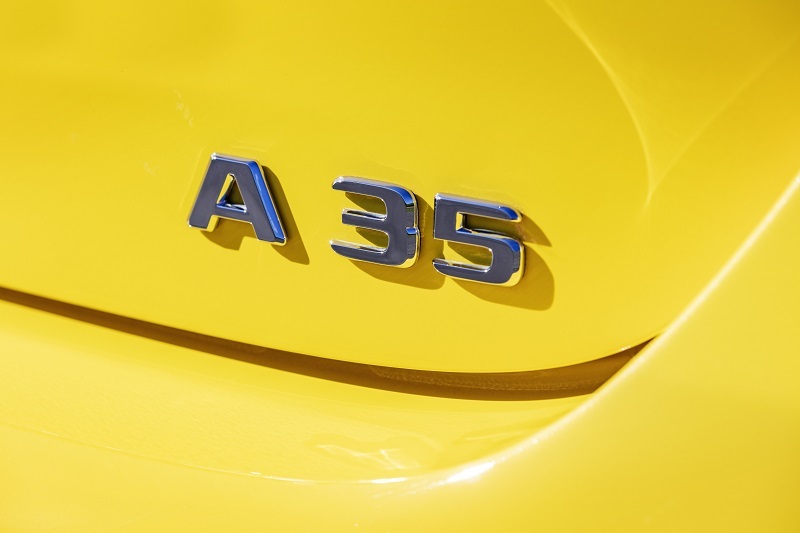 It’s not just the driving modes that offer drivers a good amount of choice; the A35 can also be specified with an optional adaptive damping control system, which is able to automatically adapt the damping of each wheel depending of driving condition. It offers three modes to cover the spectrum from comfort-based softness to a firmer, sportier ride. 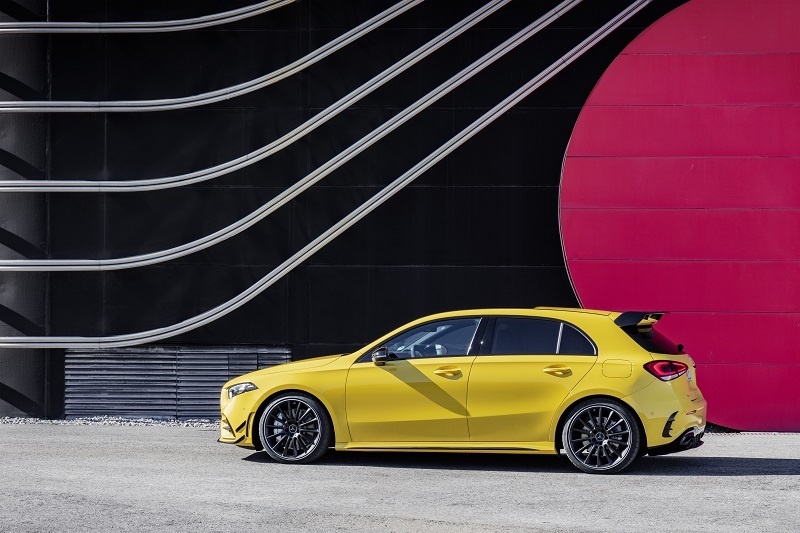 The A35 also comes with a feature called ‘AMG Dynamics’. 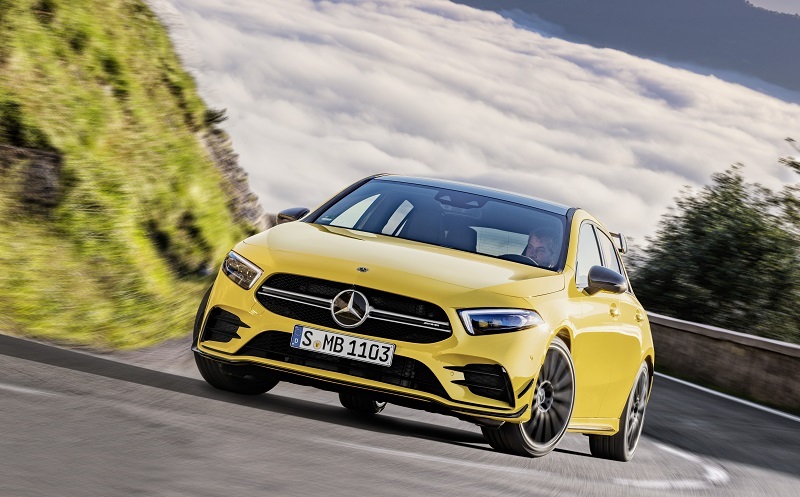 This is a new feature to the AMG Dynamic Select system, which works alongside the ESP functions to offer better handling by braking the inside rear wheel when cornering. This new systems has two different modes; “Basic” and “Advanced”. Basic is used for Slippery and Comfort driving modes, whereas Advanced is used for Sport and Sport+ driving modes. 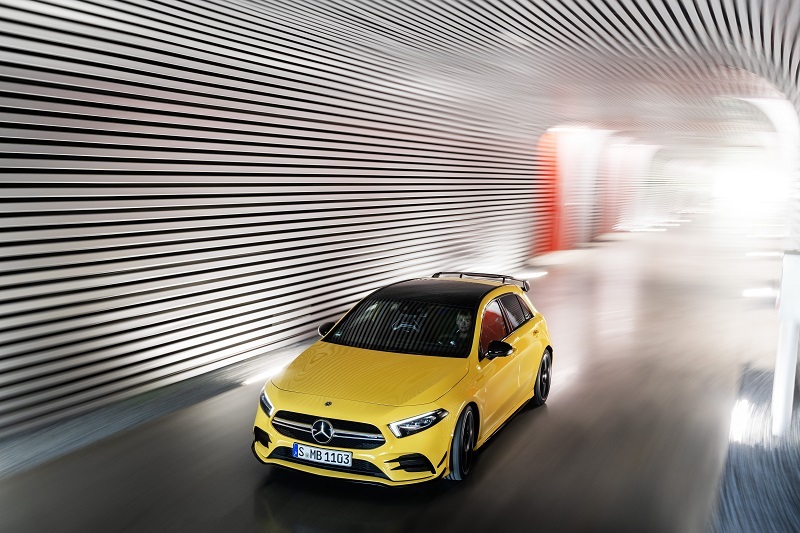 As with the standard A Class, the A35 benefits from the new MBUX system, meaning you get large, high-tech touchscreens that offer more commands than you are ever likely to ever need. These two touchscreens sit under a shared glass cover to make up what Mercedes calls the ‘Widescreen Cockpit’. This system can be used with your fingers or course, but if you feeling lazy, you can simply say “Hey Mercedes” to activate the systems artificial intelligence – I wonder where they got that idea from? The instrument display is fully digital, although we’re getting to a point where we almost expect such a function is a car such as this. 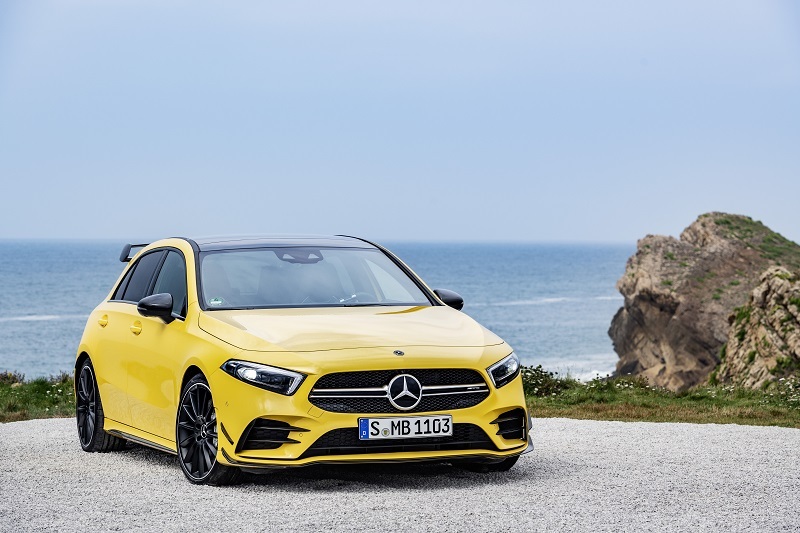 To help make the A35 feel more special than its cooking model counterparts, the display can be customised in three different AMG flavours, one of which is the Supersport mode. This gives drivers a central, round rev counter and additional information presented in the form of bars to the left and right of the rev counter. There is also a new steering wheel, which has touch control buttons, enabling drivers to change the display or to gain access to the cruise control. The multimedia controls can also be accessed this way, as can telephone and voice control functions. By now, you’ve come to realise that the A35 has everything thrown in, including the kitchen sink, but there’s even more! Well, that is if you happen to live outside of the UK. 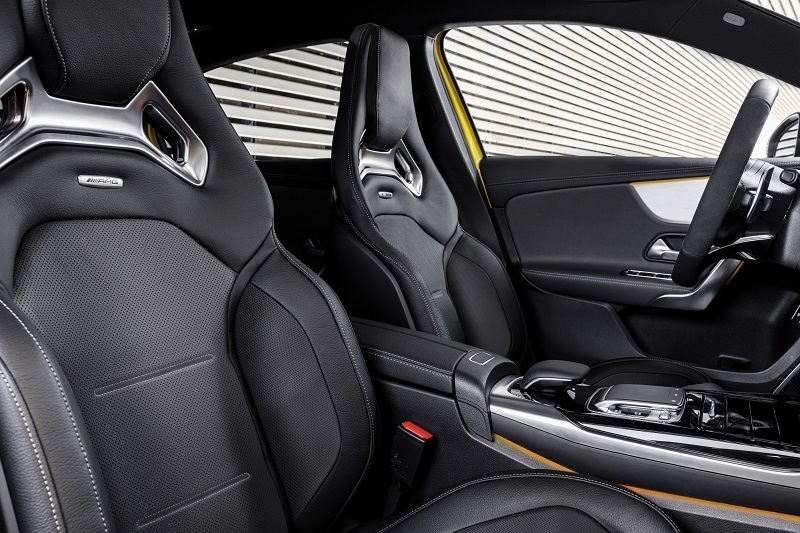 As an optional extra, you can select your A35 with the AMG Track Pace, which uses a virtual engineer within the MBUX interface. Price is yet to be confirmed, but I reckon it will be around the price of what you’d pay for a Golf R, therefore between £30,000 and £35,000. More details will be revealed closer to when the car goes on sale next month. It will then launch in the UK in the first quarter of 2019.